WEST WARWICK, R.I.--(BUSINESS WIRE)-- AstroNova, Inc. (NASDAQ: ALOT), a global leader in data visualization technologies, today announced that AstroNova® Product Identification will be unveiling a breakthrough new solution that enables AstroNova printers to digitally print food friendly, heat sealable, flexible packaging materials at Pack Expo International (Booth N-5616), the region’s largest event for the label and package printing industry. Designed to work perfectly with TrojanLabel presses, this new digital, narrow-format solution can be used in either a standalone printing mode or in-line with standard packaging equipment for a complete “print and pack” process. The combination of the unique ink and lamination offers a food friendly packaging solution that allows users to seal in both horizontal and vertical form fill and seal machines using low temperatures for high speed sealing. Going digital will easily allow flexible packaging printers to produce short- to mid-level packaging runs on demand. This feature includes the ability to print barcodes and variable data, with the precise registration that is expected from TrojanLabel presses. This printing solution can easily be expanded to include a wide array of product packaging, offering the ability to produce the exact number of custom printed packages needed. The unique, ultra-thin, white gloss PET film was specifically developed to be receptive to AstroNova’s water-based inkjet inks. The inner transparent sealing layer of the film protects food products from coming into contact with the outer layer. The water-based inks used are food friendly, odorless, and free of reactive chemistries, making them safer than other inks available on the market today. The inks are in compliance with several US, European and Japanese standards. 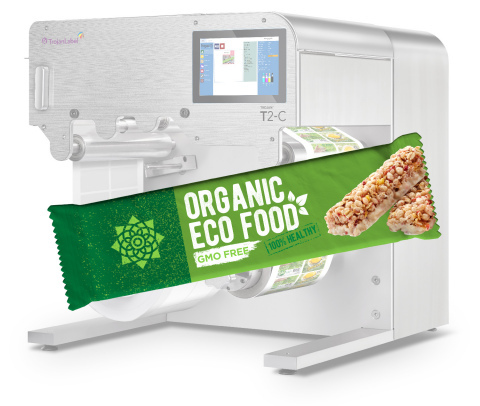 This new printing solution on flexible packaging materials will be premiering exclusively at Pack Expo, where booth visitors will be able to view live demonstrations. The expansive product line-up from both the QuickLabel and TrojanLabel business units will also be showcased. This line-up includes the new Kiaro!® QL-120 label printer, which was released to the public in August 2018. Pack Expo International and the Healthcare Packaging Expo runs from October 14-17 at McCormick Place in Chicago, Illinois. Visit both QuickLabel and TrojanLabel at the AstroNova Product Identification booth in the Upper North Building (Booth N-5616) and at Healthcare Packaging Expo in the West Building (Booth W-807). Information included in this news release may contain forward-looking statements within the meaning of the Private Securities Litigation Reform Act of 1995. Forward-looking statements are not statements of historical fact, but rather reflect our current expectations concerning future events and results. These statements may include the use of the words “believes,” “expects,” “intends,” “plans,” “anticipates,” “likely,” “continues,” “may,” “will,” and similar expressions to identify forward-looking statements. Such forward-looking statements, including those relating to growth opportunities for the new solution to digitally print on flexible packaging materials, involve risks, uncertainties and other factors, some of which are beyond our control, which may cause our actual results, performance or achievements to be materially different from those expressed or implied by such forward-looking statements. These risks, uncertainties, and factors include, but are not limited to, those factors set forth in the Company’s Annual Report on Form 10-K for the fiscal year ended January 31, 2018 and subsequent filings AstroNova makes with the Securities and Exchange Commission. The Company undertakes no obligation to publicly update or revise any forward-looking statements, whether as a result of new information, future events or otherwise. The reader is cautioned not to unduly rely on such forward-looking statements when evaluating the information presented in this news release.